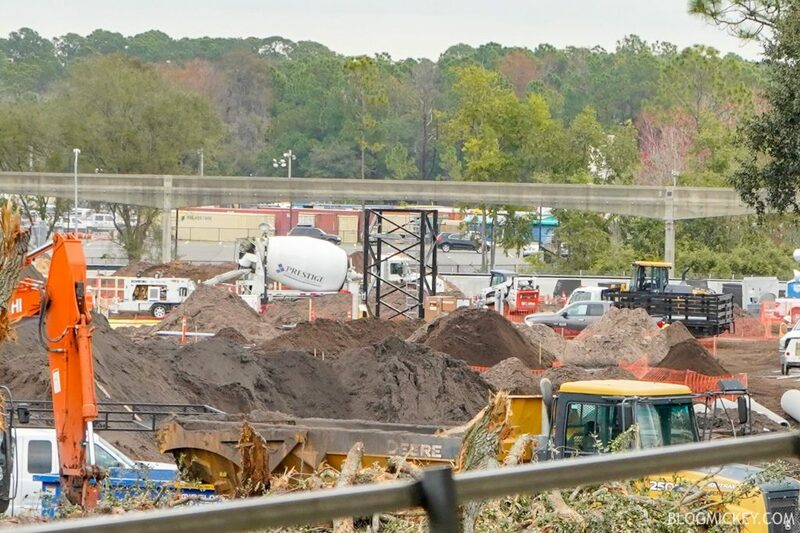 While visiting Magic Kingdom this morning, we noticed an increase in activity at the TRON roller coaster construction site. 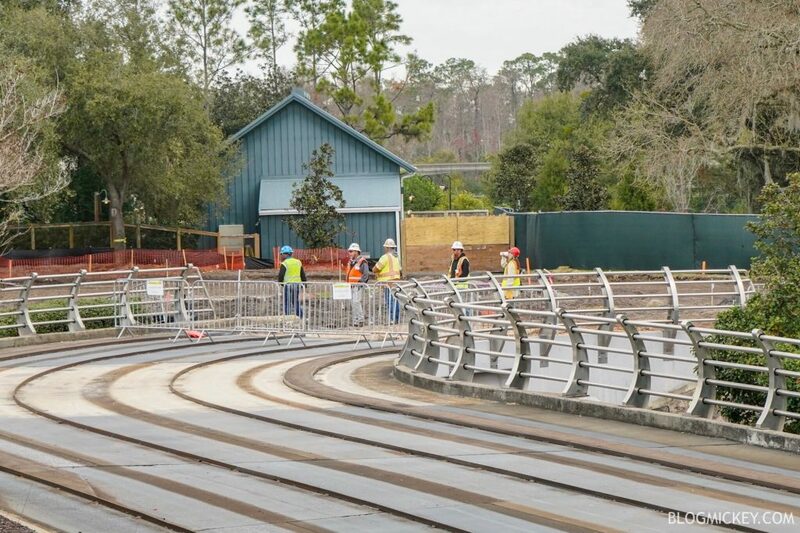 We first brought you the news yesterday that a permit had been filed for ride steel installation, so we jumped on the PeopleMover to see what all the activity was about. Let’s take a look from the Highway in the Sky. 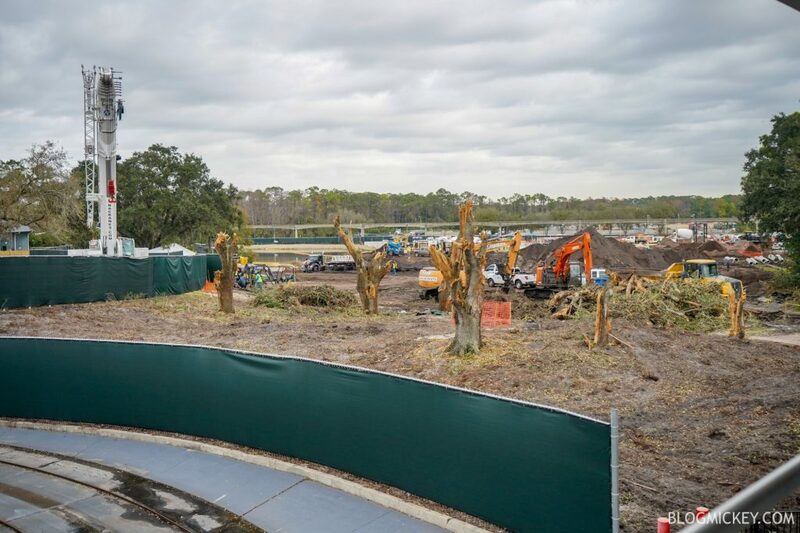 First, the demolition of a portion of the Tomorrowland Speedway is always worth a look in case you missed it. 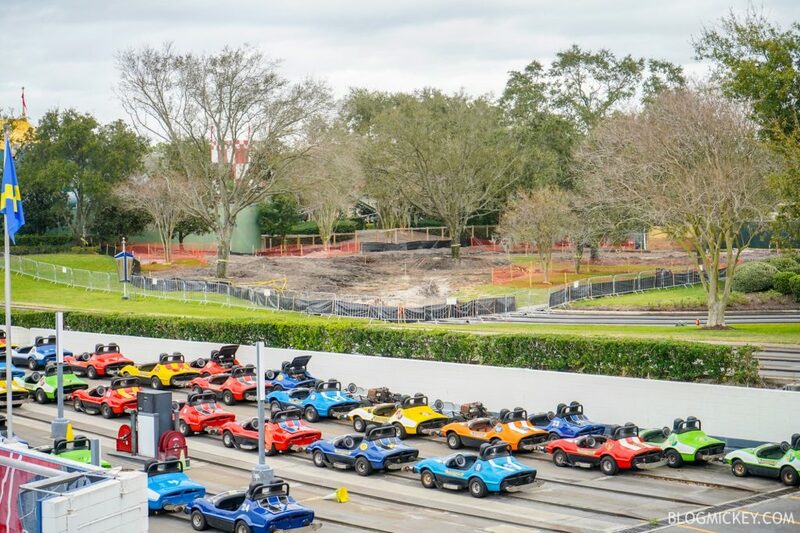 Crews were on site and it looks like the majority of their attention was on the back loop of the Tomorrowland Speedway, which has been completely removed. 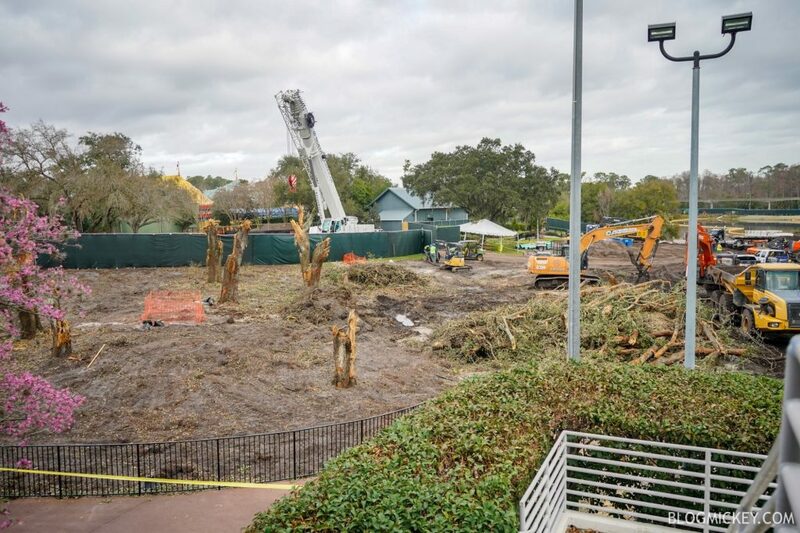 One of the big changes since we’ve last checked in on the construction was the destruction of some very large trees that use to line the walkway between Tomorrowland and Storybook Circus. 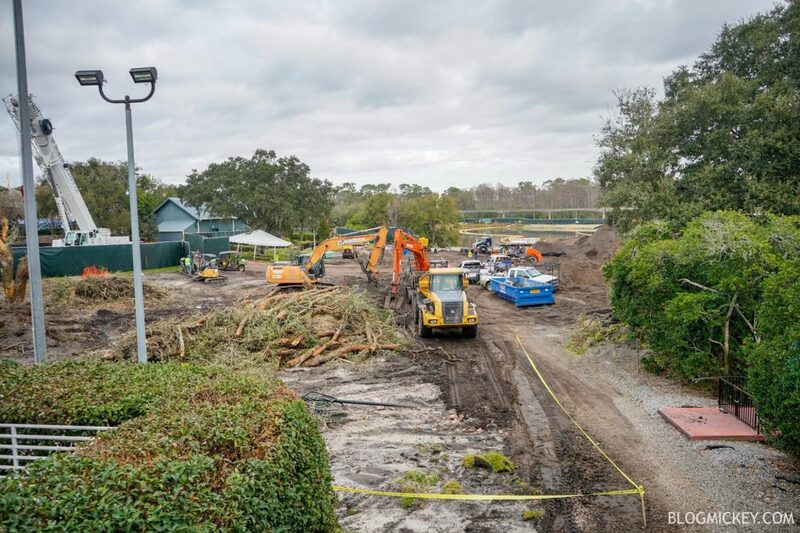 Here’s a look at the area between Storybook Circus and Space Mountain where the Walt Disney World Railroad used to run. Finally, we’ve arrived at the really exciting bit of news and that is that tower crane installation appears to be underway. Tower cranes are generally responsible for heavy lifting like what would be needed for the installation of roller coaster track or a massive show building. Of course, the PeopleMover doesn’t always offer the best views of the TRON roller coaster construction site, but if this is a tower crane, we could start to see track installation in the coming months. That certainly looks like a tower crane foundation going in. Tower cranes actually are not designed for heavy lift, just look at the type of crane being used to build the new LA stadium for instance, there are no tower cranes in use there. The advantage of her tower crane is it can work over a very large area and because of the small footprint they can be located near the center of a project thus covering almost a complete work area. Hydraulic and lattice boom cranes both have much higher lifting capacity than tower cranes. Actually, other than fixed cranes like those found in harbors, the highest capacity cranes are normally on tracks. Looking forward to this new addition to Tomorrow Land. Hope they update the Speedway to solar cars. Tomorrow Land needs some more TLC. Carousel needs to be updated. Stitch needs to go. Laugh House needs to go to Hollywood Studios. Maybe Star Tours, since it is outside Galaxy Edge can be relocated in Tomorrow Land. We will see, but Tron will be a SUPER addition.